What Gives Beer Body, Flavor, and Alcohol? As we’ve touched on earlier, beer is made up of 4 magical ingredients: Water, Malted Barley, Hops, and Yeast. But what gives beer its unique properties of body and flavor? And where does the alcohol come from? Let’s dig deep into what gives your homebrew these three qualities. This is a continuation of articles centered around homebrewing details to help you craft better recipes for your automated brewing systems. The mouthfeel and body of beer keep your carbonated drink from tasting kind of like champagne. There are a few factors which will help make your pale ale crisp, and your stouts heavy. These factors are the grain bill and yeast selection. The grain bill is the total amount of grains going into the beer making process. Different grains provide different flavors to your beer. The grain plays a role in both of the next steps, and we’ll dig into those parts more specifically in those sections. Certain grains are available to homebrewers specifically as body enhancers. They add dextrins to the beer that are unfermentable to brewer’s yeast strains. These dextrins add body to the beer, even when used in amounts as small as 0.25 – 0.5 lbs per 5 gallons. Examples of these malts are CaraPils, CaraFoam, and is sometimes just labeled as Dextrine Malt. It will increase the starting gravity of your beer, but should not be used when calculating expected final gravity compared to yeast attenuation. If your homebrews just don’t quite match up to a commercial craft beer, try using a little dextrine malt. You may find the extra body is what you were missing the whole time. Other grains can be used to add body in your beer, but instead of just providing body, add flavor as well. Wheat malt will add a sweet bready flavor to your beer and give it some extra body to boot. Hefeweizens are made up primarily, if not completely, out of wheat malts. While not always the case, they can cause the beer to be more cloudy than other beers. This is sometimes required by the style, but can also be a fla, so be sure to check style guidelines for the beer you’re brewing. Crystal malts can add some partially unfermented sugars to your beer resulting in a higher final gravity. However there is a limit to the amount you can reasonably use in a beer as it adds a distinct candy sweetness that gets overbearing quickly. It also changed the color of the beer. Flaked Oats are actually an excellent option for a rich body and mouthfeel. They are the primary driver of body in oatmeal stouts. You don’t want to use more than 30% in your grain bill as it can get gummy (think oatmeal), and greatly reduce efficiency, or even prevent you from collecting wort at a decent rate (called a stuck mash). Rye malt or Flaked Rye is similar to oat malt in that it should be limited to 20% or under for mashing concerns. However, the flavor profile of rye is significantly different than that of wheat or oatmeal. Rye malt adds a strong spicy flavor to your beer similar to rye bread. This combos great with West Coast IPA hops like Chinook, CTZ (Columbus/ Tomahawk / Zeus), and other piney, resinous hops. Body can be reduced in beer by using highly fermentable sugars like table sugar and honey. Since alcohol has a lower specific gravity than water, sugar fermenting out completely will actually make a beer drier, not sweeter. The yeast you choose will also play a role in the body of your beer. When researching the perfect yeast for your beer, look at the flavor it makes as well as the attenuation number. The attenuation is usually listed as a percentage between 68-85%. This number represents the amount of sugar that will be fermented into alcohol. The unfermented sugar is made up of longer chain sugars that are too complex for the yeast to ferment, increasing the body. For example: If you started with a gravity of 1.050 (referred to as fifty points since water is 1.000) and used a yeast with 80% attenuation, your final gravity will land around 1.010. A lower attenuating yeast will leave more suar behind and create a heavier bodied beer. For example, the highly sought after Bourbon County Stout by Goose Island has a final gravity of over 1.030! This a staggeringly high final number, but is acceptable here because of the high alcohol and lower carbonation, which needs a heavy body to balance it out. The alcohol present in your beer is based on how much sugar is fermented by yeast throughout the brewing process. Earlier we spoke about yeast attenuation in regards to body, but it also plays a role in the alcohol present in your final beer. The yeast attenuation and fermentability of sugars is what will determine how much alcohol your beer has. Yeast converts the sugar in wort into alcohol and CO2. There are different types of sugar in beer which each have their own fermentability. This is typically based on how long their respective chemistry chains are. For example your common sugars, glucose, sucrose and fructose are single chain sugars and will ferment easily. However malt sugars like maltose and maltotriose are two and three chain sugars. The longer the chain is, the harder it is to ferment and are more likely to be left behind as residual sugar (more body and sweetness). We discussed this earlier, but the attenuation percentage is the average amount of sugar a given yeast strain will ferment out of the total available sugars. To Calculate the alcohol percentage in your beer, take a gravity reading before the yeast is pitched. A typical beer will have a starting gravity of 1.050-1.065, and a typical final gravity of 1.009-1.014. Starting Gravity 1.062, Final Gravity 1.011. 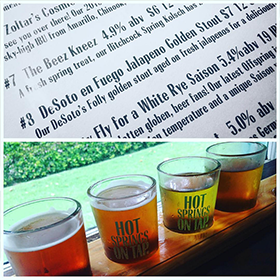 All elements that go into brewing play a role on the flavor of your beer. we’ll cover each below briefly, but for each of the four primary ingredients, there is a whole can of worms when it comes to the flavor contributions in your beer. The chemistry of your water actually plays a big role in the flavor of your beer. And have water that is good for brewing chemically and free of off flavors will create a better beer. For example, If your brewing water has chlorine in it, you may end up with chlorophenols which taste like cherry medicine. If the pH is too high, you can get bitter tannins and a reduced hop flavor or aroma. 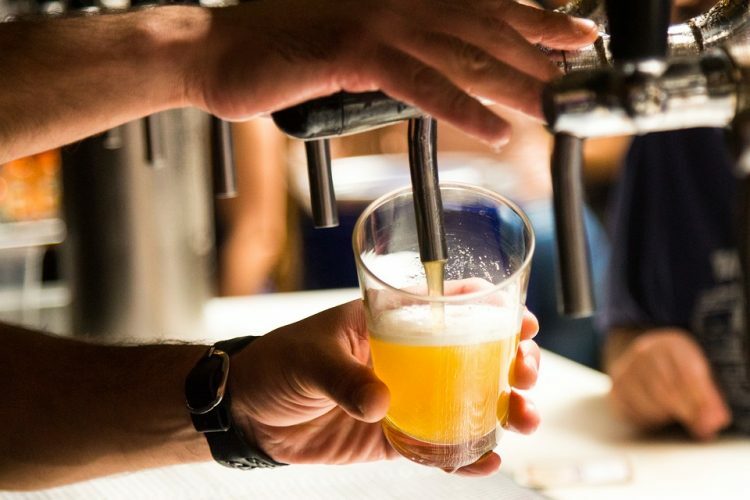 The chlorine issue potentially is the most detrimental when working with automated brewing systems that pull directly from your tap water supply. Odds are it has chlorine in it. You can remove chlorine by adding ¼ of a camden tablet for every 5 gallons of water. This will remove all chlorine and chloramines in water almost instantly. When yeast ferments sugars, it creates alcohol, as well as other byproducts called esters. These can be good tasting like a mild fruitiness in an English ale, or they can produce a nail polish remover taste if the temperature is too high. The byproduct of fermentation (alcohol), also has a flavor contribution. High alcohol beers have an alcoholic warming taste too them which can be quite pleasant if there is enough body to back it up. However a very high ABV in a low bodied beer can taste off-balance. Malt adds a large portion of the flavor to your beer. Different malts add a wide range of flavors from bready, to coffee, chocolate, and caramel. There are well over 50 kinds of malt to choose from for every batch of beer you make, and as long as you stick to your grain bill principles, you should be making great beer every time! Hops add bitterness to balance out the sugary sweet malt. 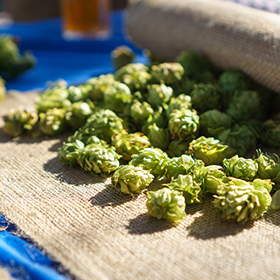 Hop additions, depending on when they are added, can also add flavor and aroma to your beer. Almost all of that tropical fruitiness in your NEIPA is derived from hop additions. Read about what each hop’s flavor and aroma profile is to see if you want to try it out in your next beer. Hopefully this article sheds some light on how one of the world’s oldest fermented beverages gets its signature profile. If you have any other beer making questions, feel free to contact us!